Where books are what you breathe…. The name sounded different. There was something about it, though. It kept coming back, in some article or another. I got to know it was a woman and she was usually referred to along with my new favorite author Sadat Hasan Manto. Then another article mentioned something about controversies, and I love such women. The name was ear marked and stored in one of those soon to be retrieved shelves of my memory. I could never resist the crinkle in his eyes. And there he was, saying wistfully, “if only we can live half the life she lived..,” fondly referring to her as Ismat Apa. Who is this woman? Curiosity got the better of me, as Naseerudeen Shah talked about meeting her, on her controversial short story ‘Lihaaf’ and how he, his wife Ratna Pathak Shah and daughter Heeba decided to stage their play on her, in Urdu, ‘Ismat Aapke Naam.’ The name was dusted afresh and pushed towards the front of the memory shelf. Short stories were a genre that I usually kept away from. Maybe the reader in me wanted the stories to go on for ever. With work that never seemed to end, the long form was turning into something that had some hard demands. And I turned towards the ones that took the time of a short break. The stories transformed themselves into an alternative for the banter across the cubicles and long coffee sessions that I were missing, as I worked more and more from home. Pick up one, read a couple of stories. Keep it aside, pick another one, and so it went. As can be expected in such cases, Begum Jan withered, devoid of attention from husband and family. Until Rabbo arrived with her oil of secret ingredients and the never ending massages. The girl is obviously enraptured by the sensuous Begum Jan, but is old enough to sense something is not right between the Begum and her trustworthy masseuse. As night falls, the tom boy turns into a timid girl who is scared to sleep alone. Having slept off in a small cot in the Begum’s bed room, she wakes up in the middle of the night to some muffled sounds in the room. In the dim light, the quilt on the Begum’s bed has come to life. To her young mind, it is as if an elephant had got under the silken quilt. The strange noises and the billowing shapes frighten her no end. The story goes on to say how the girl grows up overnight in the Begum’s hands and the animals that she find under the quilt. The real story is between the lines. In the words that are not written, but those you could still read. Of the stereo types that young girls are expected to be. Of marriages that are not. Of vices that are camouflaged as virtues. Of repression, sexual and emotional. The ways in which women escape, and how, at times drag their own down, along with them. Yet, nothing is overt, not a word is out of place, nothing is even remotely sexual. Remember Deepa Mehta’s ‘Fire’ and the controversaries it created? One cannot but relate Begum Jan to the characters portrayed by Shabana Azmi and Nandita Das. Women who are forced into marriage and men who find satisfaction elsewhere. And the finding of happiness where they can find it. If ‘Fire’ created so much heat at the beginning of twenty first century, imagine the furore such a story could have created in the Lahore of nineteen forties. 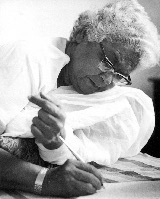 Ismat Chughtai had to face an obscenity trial for this story and was asked to apologize. She promptly refused to do so and defended the case by herself. The prosecution failed miserably in establishing their case, for the story was said from the perspective of a young girl, there was no obscenity whatsoever anywhere, and she had woven the story in a suggestive manner. And she won. Some woman, eh? * Name of the play on Ismat Chughtai, produced by The Motley Theatre Company. Books signed by authors, I have a few. But a book launch? Never. So when V, a good friend, sent out an invite, I was excited. For more than one reason. V is a born raconteur and his sense of humor is truly out of this world. So by law of genesis or whatever, his brother had to be a chip off the young block, I presumed. And rightly so, I was to find out. 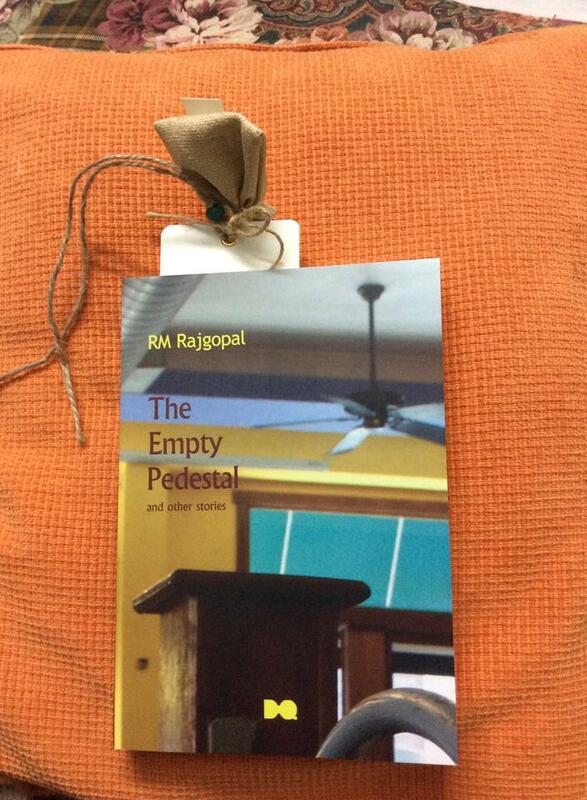 RM Rajgopal, the author wrote these stories ‘while pursuing a hectic career,’ says the introduction in the book. And the author corroborates it when he says tongue-in-cheek that he has a lot to thank Indian Airlines for the number of delayed flights, most of these stories were written either while waiting at the airport or while on a flight. Apparently he used to carry and notebook and pen with him, always. That he must have observed a lot, not just in the course of flying, is evident from each of the story that he has penned in this debut collection. ‘The Empty Pedestal’, the title story, and the first one in the book is about how times change and the labor leaders along with it – from being idealistic to realistic . The tone was a little sombre and I was more than a little disappointed. I had an inkling of the next one, ‘They Listened’, this was one of the stories from which an excerpt was read out at the launch. An old musician’s yearning for at least one discerning ear and how a few choice requests change his whole life, albeit for a few days, is told so well. The true meaning of that twinkle of mischief in the author’s eyes starts getting visible from the third story, ‘A Genuine Blonde’. The climax is brilliant, I wouldn’t dare to add any spoilers here. That he is still a boy at heart is brought out in the following stories about a nursery interview, the swaggering senior in a boarding school, and a boy who has lost his mother. The brash Punjabi graduate in ‘A B-Class Abode,’ the hapless Krishnaswamy who is caught between the eternal tangles of principles and an avaricious wife in ‘Principles and the Price Line,’ the ill fated Umesh in ‘Sharing a Berth,’ – all of them are characters taken straight out from life. We would have encountered them sometime in our lives, their stories are heartening and tinged with the pathos of middle class life as it truly is. That Mr. Rajgopal decided to have ‘A Guffaw in the End’ is so apt. It is the changing face of today’s woman, practical, clear of what they want, they knowing exactly where they stand and how they will walk their life. The charm of this collection is how true to life each story is. That the author is a keen observer of what happens around him need not be stated, his tales speak for themselves. What is also evident throughout is his zest for life and the eyes of a naughty boy that looks at life through his sparkling eyes, hiding his seriousness behind resounding laughter. However, what enamored me totally is the exquisite language, there is that unmistakable charm of old world. You feel as though you are sitting at the end of a long dining table, the dinner is done, you are picking at morsels now and then, the tinkle of crystal and the muffled sound of silver on porcelain somewhere in the background. Your eyes and ears are keenly attuned to this sixty something charismatic, worldly wise guy, churning out tale after tale amidst loud bursts of laughter, with a few guffaws thrown in here and there and the inevitable anecdotes by others around the table, adding to the spice. The kind of night that you wished never ended. Verdict : If you are one who loves tales that smell of life as we know it, told in an exquisitely elegant manner and impeccable language, a must read. You will love it. The tattered copy had a forlorn look as it called out to me from a nondescript corner of Blossoms on Church Street. The book and its author were totally unfamiliar, yet there was something that pulled me in and made me open the cover. 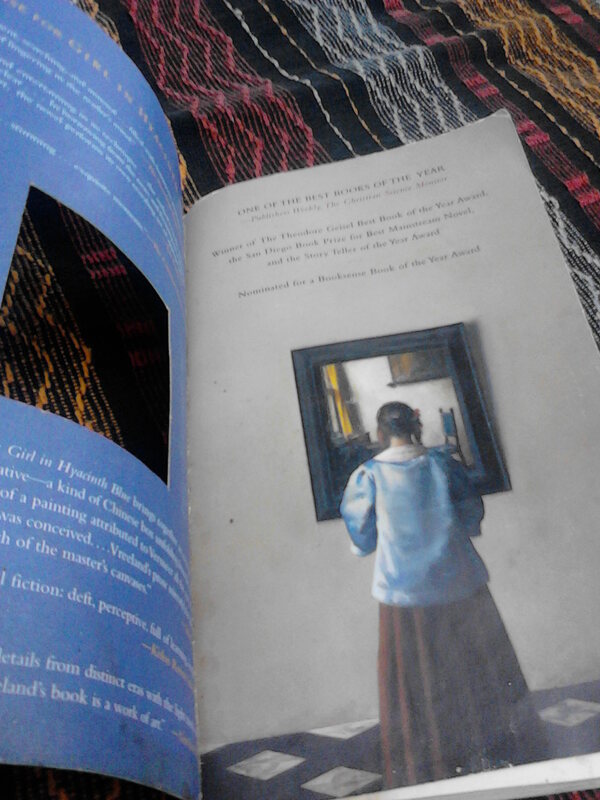 The window on the cover opened out to an intriguing picture and the book was mine. The professor is almost shameful to disclose how it came into his possession. He just says that it was given to him by his father as he was dying. Thus starts the journey of the painting, going back in time. It took me the first few chapters to understand the connection and then I read in one of the reviews that some of these chapters were originally written as short stories. The author traces back the painting through each of its owners spanning three centuries and finally ends with the girl in the painting. Mostly set in Holland, each story portrays the passionate feelings that the picture of the girl evoked in its owners, if you may call them so. The reticent Hannah finds her own reflection in the girl, while for Laurens, it was a sweet remembrance of a girl he had loved and lost, For one lady it paid the price of her release and for Adriaan, it was a means for someone to bring up his illegitimate son and an uncomfortable reminder of the girl whom he did not stand by. As for the girl in the painting, it was a much awaited acknowledgement from her father. The language is almost poetic, there are some great descriptions of the painting, specially about the shades of hyacinth. For a non- connoisseur like me, the author has given some great insights into how the great painters achieve the effect of colours and lighting that makes us immediately recognize their works as masterpieces, and how they leave their own signatures. Verdict : A short book comprising of eight short stories, this is a delightful read for a lazy afternoon. You may need some extra time to pause and reflect, at least after a couple of stories. Over the years, Deepti Naval has remained one of my favorite actors – simple, subtle, down to earth and totally classy. Her short stories are also more or less like her. Drawn from real life, characters that we might have seen somewhere along the way and set in scenarios that many of us are familiar with, the stories are told in a straight from the heart, no frills style. ‘The Piano Tuner’ leaves us with a sense of melancholy while ‘Sisters’ transfers the pain of their helplessness to us. ‘Premonition’ left me a little confused as to what it meant , while ‘Birds’ again ends in a sad note. ‘Bombay Central’ shows us the strange turns that life can take and ‘The Morning After’ is a tale of hope. The next four stories are more of memoirs and I loved these the best. ‘D’ is about how she meets a childhood friend and a situation that many of us would be familiar with, the difference is in the fact that the author here is a celebrity. 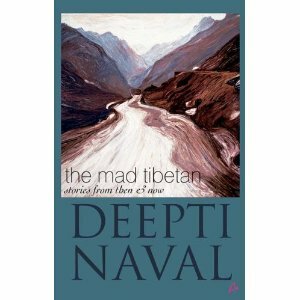 The title story ‘The Mad Tibetan’ is about someone whom we would have met in the bustling streets of any city as well as the calm bylanes of a village. She meets this mad man in a far off , almost deserted place in Ladakh. The scenery is captured beautifully in her words. ‘Balraj Sahni is about how she meets the great actor for the first time and ‘Ruth Mayberry’ about a screen writer who has been writing that one screen play for seventeen long years and how the wait ends. The overall feeling of the stories is a little melancholic. I thought it reflected the t shades of emotions that we see in the author’s eyes – a tinge of sadness and that feeling that she is somewhere far away. Verdict : Not a ‘must read’, for sure. You can pick it up as a light read and finish it in less than a day.